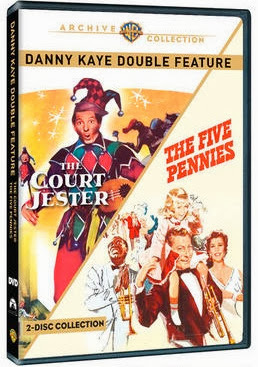 Rupert Pupkin Speaks: My Warner Archive Grab Bag: Danny Kaye Double Feature - THE COURTJESTER / THE FIVE PENNIES and THE GATHERING ""
I've often heard it told that THE COURT JESTER is Danny Kaye's finest hour. Riding high expectations, I had given it an attempted watch on at least two occasions before and somehow it didn't quite connect for me. I must chalk this up to not seeing the film all the way through with either of those outings. In viewing the film in its entirety(as I should have done in the first place), I can clearly see why it has the reputation that it does. It is a work of great comic execution by Kaye. He plays a wonderful mix of a coward and a cowardly man feigning great bravado. It is very much a performance (though I've never heard it acknowledged) HAD to have been of considerable influence on Woody Allen. I found myself thinking of Allen's 70s comedies throughout THE COURT JESTER. Think THE ADVENTURES OF ROBIN HOOD, but with an Allen-like oaf in place of Errol Flynn. One comic bit that I don't immediately associate with Woody Allen is at play here as well and it's quite fun. It's a certain kind of comic wordplay, basically it features characters repeating bits of dialogue to each other in sort of a 'tongue twister' kind of style. It requires the actors (Kaye in particular) to speak very quickly and very precisely and it us pulled off with wonderful aplomb. Kaye really shows himself to be a jack of many trades here in his abilities with singing, dancing and comedy. So Kaye is obviously wonderful here, but he is flanked by a lovely supporting cast including Basil Rathbone, Angela Lansbury and Glynnis Johns. Never before have I found Angela Lansbury so desirable. Her low cut, princess dresses put her exquisite shoulders on display in a way I've not seen before. Her character is rather silly, but she is lovely. Speaking of lovely, Glynnis Johns (who most will remember from MARY POPPINS) is also quite adorable here. Basil Rathbone plays his standard villain-y self and carries it off perfectly. Even John Carradine has a great small role! About 15 minutes in, THE FIVE PENNIES features a great little scene at a speakeasy wherein Louis Armstrong plays a quick tune and then Danny Kaye gets up on stage with him. It's awkward, but Armstrong and Kaye play off each other really well. Kaye plays a small town coronet player from Utah who's had a little too much to drink. As the scene continues, it blossoms into a fantastic impromptu musical number with Armstrong joining in. It's a solid good time. 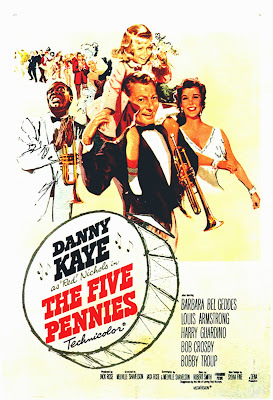 But interestingly, what starts as your normal Danny Kaye comedy hits a few dramatic patches amidst its lighter moment. It's not as downbeat or noirish a musical as Scorsese favorites BLUE SKIES, THE MAN I LOVE or LOVE ME OR LEAVE ME, but it definitely has a bit if an edge to it and dips its toe into some darker waters along the way. Barbara Bel Geddes is ridiculously cute and charming here and that helps keep things mostly on the up and up. And Kaye is his usual super-performer self so he doesn't disappoint with his performance. As much as I can't say I wholeheartedly love all of his films, watching mny of them back to back to back has given me a newfound respect for his skills as an actor, singer, dancer and comedian. He has an energy about him that is at once almost manic in its peaks and valleys. Yet he is so talented that one can't help but be impressed. You really get the impression that he was a hard working guy that had two feet on the ground. He doesn't seem arrogant in this way that some performers if his caliber tend to. He is a remarkable fellow to be sure. From Hanna-Barbera (!!) and the director of GREASE (also FLIGHT OF THE NAVIGATOR and SUMMER LOVERS) comes this truly touching holiday TV-movie with an all-star cast. Ed Asner plays the patriarch of the Thornton family. He and his wife (Maureen Stapleton) have been separated (but never officially divorced) for a long time and their children have scattered across the country. 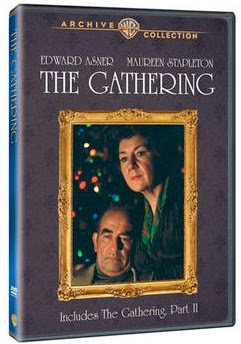 When Asner gets news that he only has a few month left to live, he goes to his wife and they do their best to coax all of the kids to return home for a Family Christmas Reunion. Via flashback and present day interactions with the children and their respective spouses, we are able to piece together how things were left in disrepair between Asner and them years ago. It's tricky not to draw parallels between this and THE ROYAL TENENBAUMS a bit, though I'm not claiming this is an unheralded influence or anything. Obviously this film is considerably more dramatic and has little comedy to it all. The cast includes Bruce Davison, Rebecca Balding, James Karen, Gregory Harrison, Lawrence Pressman, John Randolph, Stephanie Zimbalist and more. It is a pretty well done made for Television film and one that I must admit to have been affected by. I thought I was truly done with being caught up emotionally in schmaltzy holiday films, but this one is better than I expected. I guess the key is that it's a Christmas film, but it's really about this family and how they are trying to put aside old wounds and enjoy each other and the Christmas thing is secondary. It really is one of those movies that makes you want to call your parents up as soon as you've finished watching it. I must thank one of my favorite film critics, Alonso Duralde, for turning me onto this film via his book, Have Yourself a Movie Little Christmas and his wonderful podcast Linoleum Knife.